Yesterday, Bongani Masuku, whose infantile hate-filled speech has already been covered on this blog (here and here), addressed a kingergarten-style meeting at Wits University in Johannesburg. The meeting was authorised by Wits and hosted by Wits Palestine Solidarity Commitee, the Young Communist League and the Progressive Youth Alliance. Anthony Posner, who initiated the series of emails which revealed Bongani for the unrepentant ghoul of hate that he is (demanding that Jews who support Israel leave South Africa), was on hand at the Wits meeting and has sent us the following guest blog. Remember, Cosatu is a member of the ruling ANC tripartite alliance. A vote for the ANC is a vote for Cosatu. They are also important backers of Jacob Zuma and expect to have more influence once he is presiding over the country. At the Wits South West Engineering Block, that was the question. Whether twas nobler to suffer the slings and arrows of outrageous anti-Zionism. Or to get up and leave like I did in 2007 when Ronnie Kasrils labeled me "The Dictator"? There are two schools of thought about viva-ing. The first is that it is a bit old hat, rather like a song from The 80's, that didn't really grab you. The second is that it has never gone out of fashion. An eternal classic. As a relative newcomer to SA, I unfortunately missed it all the first time around, so I was certainly not now going to let the opportunity pass, even if I did have major issues with some of the sentiments being expressed. And of course, there was also "Amandla" which is another golden oldie. Who could resist it? Bongani Masuku is a serious Cosatu revolutionary, zealously committed to the fall of Jerusalem. And although, Johannesburg is a long way off he is not deflected. Yes, Bongani is a man on a mission. A taller, thinner, darker version of Ronnie Kasrils, and without the Jewish avuncular demeanor. In the end I decided not to introduce myself even though we had only recently engaged in an email exchange of quite epic proportions. I had even invited Bongani to join a new poetry club, but alas... it never came to fruition. Instead I was informed that South African Jews who did not agree with Cosatu's solution to the conflict in The Middle East should be "forced" to leave the country. So much for my attempts at a "poetic" way forward! "Away with Israel" "Away with oppressive regimes" "Amandla etc" "Viva Wits PSC Viva" "Viva Cosatu Viva" "Free Free Palestine." "Amandla" "We are fighting our own struggle" "Apartheid Israel is apartheid South Africa." "Viva, Viva, Viva". "Zionism Down" "Palestine will be free." And there was the usual other stuff. "You can leave this country. We will defeat the racists" "I don't care whether it is antisemitic" "Anyone who handles goods to or from Israel...Beware!" "Your life will be hell". Well, quite a concoction of threats and more threats. But, SAUJS were not intimidated and did some fine heckling which included... "Should Helen Suzamn have been forced to leave?" And I concluded the proceedings with some verbal dexterity of my own ... "Viva antisemitism Viva!" After the meeting in the Wits sunlight, I bumped into four freindly guys from the Islamic Republic of Iran Broadcasting (I.R.I B) I am not sure what they were doing there but we got on really well and swopped emails. So all is not lost. I will contact President Ahmadinejad. [Referring to International Solidarity Conference] “Our duty is to make sure that we heed them where it matters the most. The following things are going to apply: any South African family, I want to repeat so that it is clear for anyone, any South African family who sends its son or daughter to be part of the Israeli Defence Force must not blame us when something happens to them with immediate effect”. Anti-Semitic graffiti adorned walls and dustbins at the University of the Witwatersrand (Wits) this week in commemoration of the 60th anniversary of the founding of the modern state of Israel or as the Palestinians call it, the Nakba (Catastrophe). Swastikas and slogans like ‘Jews Die!’, ‘Zion will Die’ and ‘Jews = Magen David = Nakba’ were scribbled in red paint. The graffiti appeared after the Palestinian Solidarity Committee convinced officials to allow the graffiti wall to be used to debate the Israeli – Palestinian conflict. It is unthinkable that in our multi-racial democracy, on one of the country's most liberal universities, such crude racism would be so openly displayed. The graffiti has now been removed but much more needs to be done. Those responsible for the promotion of this anti-Jewish hatred and vandalism on campus need to be found and charged. Moreover a public condemnation from the university must be issued. The irony of these sorts of ugly incidents is that in addition to inciting hatred against Jews, they only serve to weaken the Palestinian cause. For it gives credence to the argument that pro-Palestinian activism has at its core some element of anti-Semitism. Perhaps we shouldn't be too surprised when students are able to distribute this trashy incitement on campus. If you see anything that you think we should include on our Campus Corner, be sure to let us know. Our email is at the top-right of this blog. A newspaper called the Palestine Times caught my eye at Wits University the other day. It’s a wretched newspaper published in London, and students are seemingly distributing it at Wits University. I can’t claim any expertise on the legalities of distributing material like this on university campuses, but having examined 3 issues, there are certainly no stamps permitting the distribution. It’s not actually the right to distribute the papers on campus that I wish to examine. 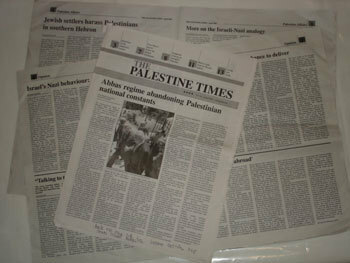 It’s the content of this newspaper and what it says about the pro-Palestinian crowd at the university that worries me. At a time when student leaders could be conditioning their groups for the concessions that need to be made at Annapolis, it’s rather sad to see a publication of this standard being dished around. I have since grabbed three different editions. The content of the publication is sour, hateful and overwhelmingly childish. Really, really childish. The contributors can’t even bring themselves to mention the IDF by its proper name, instead resorting to chants like “Israeli Occupation Army” or the “trigger-happy Nazi Gestapo.” Zionism is “Zio-Nazism” and the settlers are “Judeo-Nazi settlers.” How very prekindergarten. The allegation that Israel is a Nazi state is a constant theme in the issues I perused. One article entitled “More on the Israeli-Nazi analogy,” challenged the “Zionists and their supporters and apologists to prove that Israel doesn’t harbour a final solution for the Palestinians.” The author then claims that Israeli leaders openly admit that they wish to see all of the Palestinians dead. Is this what naïve students should be reading on campus? That Israel is planning to do as the Nazis did and attempt to wipe out an entire people! What will these students then think about Jewish students who support Israel? Really? You can't respond to that. It's like someone recently said in the comments of this blog -that in the battle for public opinion it is difficult to fight lies with truth because truth is limited but falsehood can be accommodated to match any argument. Moving on...it’s not just Israelis or Zionists that are caricatured as Nazis. Another article attacks Ashkenazi (European) Jewry. The Nazi libel goes on and on and on. “The Nazi like occupation of Palestine by Israel is not the act of a few Israeli Jews. It is not even the act of a military establishment alone. It is the collective act of a morally desensitised society that has nearly lost its humanity and succumbed to a collective psychosis that is not unlike the moral blindness that struck the German people more than 60 years ago." Is it reasonable to compare Jews to Nazis? I recently reviewed a UN report by the Special Rapporteur on contemporary forms of racism. The report, adopted by the UN in August this year, is entitled “Racism, Racial discrimination and related forms of intolerance: follow-up to and implementation of the Durban declaration and programme of action.” The report will get an blog entry of its own, but briefly, let’s take a look at what the report says about anti-Semitism. Hmm…if it walks like a duck, acts like a duck and quacks like a duck, then...it’s a duck. I’m not saying it, the UN report, adopted by the General Assembly, is saying it. And so I ask you, should this incitement be allowed on a university campus? My bet is that it’s not allowed, hence the absence of a stamp permitting its distribution. But I don’t think we can expect anything to be done and sadly, I don’t think we have anything to gain in complaining to the university chancellor. So no, I can't be bothered to even look up the chancellor's email address. The predictable response would be accusations that we are trying to control the debate by stifling freedom of expression. Ho hum. I just hope that the local distributors at Wits end up sending the reverse signal. I hope that they have overplayed their hand and that this evangelism of hate ends up exposing them for what they really are. Interestingly, one of the recent issues sports an article by our very own voice of Palestine, Mr Iqbal Jassat, from the South African Media Review Network. On Tuesday this week Ronnie Kasrils spoke at Wits University in Johannesburg as a guest of the Wits Palestine Solidarity Committee (WPSC). I was hoping to attend but couldn’t make it so I don’t have a detailed report but here's a report from the Citizen. SOLIDARITY movements should put pressure on governments worldwide to impose sanctions on Israel, the way they did with South Africa, to ensure that country liberates itself from racial paradigms, Intelligence Minister Ronnie Kasrils said yeserday. He told students at the University of the Witwatersrand yesterday the situation in the Holy Land was similar to that in South Africa during the apartheid era. He said it could be resolved through boycott and isolation as foreign governments had done successfully with apartheid South Africa. Kasrils, a former Wits student and founder of the Not In My Name South African Jewish solidarity group, was speaking at a rally and the launch of the Wits Palestine Solidarity Committee (WPSC) about whether South Africans had a responsibility to the people of Palestine. He said: "South Africans have seen it all - from what can be achieved through violence towards a democratic nation to how crucial negotiations are to bring about democracy and justice for all. "As far as Palestine is concerned, South Africans should stand for a solution that guarantees peace for the people of Palestine without prescribing whether or not they adopt a proposal by the Zionists that the country be an exclusively Jewish state." Muslims, Christians and other religions in that country want it to accommodate all religions and races, a view supported by the WPSC. WPSC members told The Citizen they wanted the "apartheid-riddled holy land" to be like South Africa and accommodate all its citizens "regardless of religion, race, gender and sexual orientation". Academic, consumer and cultural boycotts of Israeli institutions, organisations and products were proposed at the rally Kasrils, a South African of Jewish Lithuanian descent, added that South Africans could assist through acts of solidarity. He hoped this would assist to bring about peace in that country as it had done in South Africa. I believe that many PSC students are probably acting out of sincere - though misinformed and misdirected - concern. The naive PSC students probably believe their own propaganda but I am confident that Kasrils knows that there already is a country in the Middle East that accommodates all religions and races and it is called Israel. Israel is a secular democracy with a Jewish majority and a substantial Muslim minority where all races and all religions are accommodated as equal citizens. Twenty percent of Israel’s citizens are Muslim. They have the right to vote, they can form political parties and are elected to the Israeli Knesset. An Israeli Arab sits in the Israeli Supreme Court. Israel is the only country in the Middle East with female Muslim judges. I could go on and on and on. For more, browse through the IAS apartheid section. Predictably, Kasrils likened the ANC freedom fighters to Palestinian terrorists. It’s important that students know how to challenge these feeble attempts at revising the past and distorting the present. You can start by reading this post on comparing the ANC to Hamas and then this post comparing the ANC’s freedom charter to the hateful PLO charter. A peaceful settlement will require an end to the hateful attitudes and speech that Kasrils both employs and helps create. Wits student site Vuvuzela also has a report of the Kasrils talk: Learn facts about the Jewish state, says Kasrils. The SAUJS (South African Union of Jewish Students) memorial to victims of global terrorism at Wits was completely defaced on Tuesday. In a brazen act of vandalism, most of the text as well as the SAUJS logo was painted over. So much for freedom of speech at one of South Africa's leading liberal universities. 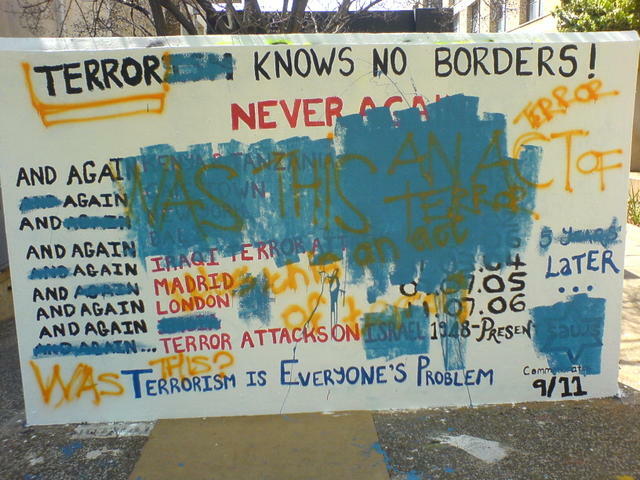 Yellow spray-paint was used to write the words "Was this an act of terror?" all over the wall - this being most likely a reference to the September 11 attacks themselves. This surely represents the height of ignorance, intolerance, and insensitivity. The matter has been referred to campus security for investigation as the previous incident where a Palestine Solidarity Campaign (PSC) mural was defaced. The radicals can't remain calm and their own deeds will reveal what and who they are. For more on this head over to the Wits student site Vuvuzela which reports on the earlier defacement of a PSC mural (on the wall) which accused Israel of being an Apartheid state. "Two days after the PSC had painted its slogan, the wall was covered with SAUJS posters. Two days later the posters were taken down and an obscenity was scrawled on the wall that accused the PSC of being anti-Semitic." Got any campus news that you want published? Let us know. Over the last months, a vicious anti-Israel campaign has been waged on Wits campus by the Palestinian Solidarity Committee. 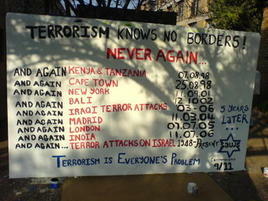 This week to coincide with the 5th anniversary of 9/11, the South African Union of Jewish Students (SAUJS) hit back with a memorial to all those who have been murdered in terrorist attacks (See picture above). It sends a powerful message that terrorism is not only the problem of Israel and the Jewish people but the entire world.